This is a more modern pub in Leominster with its updated bar area, but the rest of the pub still retains the beams and low ceilings of old. 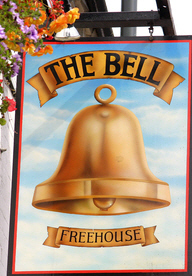 Situated down a side street off South Street, The Bell usually has up to 4 real ales on, all of which are well kept and served. The bar faces you on entrance and is a horse shoe shape, but not very large - disabled access is possible to this point, but not beyond. To the right is a more public bar area, though as this is not a large pub, there is no real differentiation. To the right and up a step is the lounge area with a bay window seat and bench/settle seating along with chairs/stools. The toilets can be accessed from the rear garden. Talking of which, the garden is a patio out rear and is a sun trap. Food is served here lunchtimes only and the chalk board in the lounge area tells you what you can have. The prices are usual but the portions are mammoth size and are great value for money. The Ploughman’s has almost a pound of cheese with it! 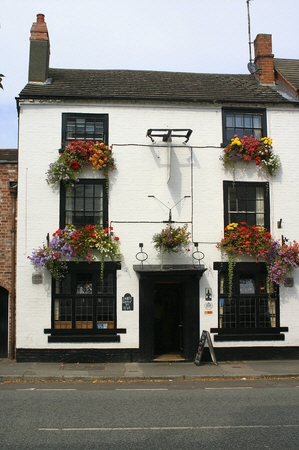 For the winter there is a real fire and they have live music Tuesdays and Thursdays. Well worth a stop if in the town/area. Also try: Black Horse; Grape Vaults.